A couple of weeks ago we got ourselves a nice new cabinet from IKEA for our games. We had been storing them on a bookcase and realized that once Oliver is mobile, he could easily pull the games off the shelves and hurt himself or possibly even get into the boxes and take the small pieces out. So, we did some looking online first and saw that IKEA had a nice cabinet with doors that we can put a lock on and decided we should get one. We had been dragging our feet a bit on doing so, but then Nate wanted something to store the NES games he's been collecting on so I made him a deal - he could have the bookcase that the games were on if we finally picked up the cabinet we'd been talking about. So, now it resides in our living room and I love it! Oliver's adventures in solid food continue. 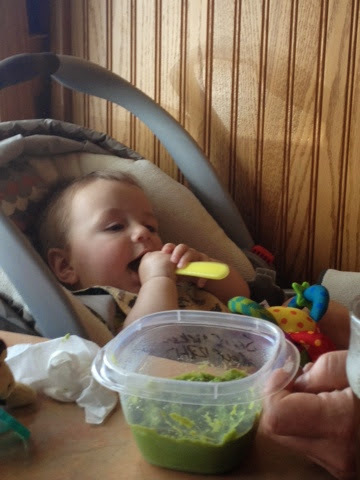 We find he is actually quite interested in trying to feed himself - so we let him take the spoon and go nuts! He loves his spoon so much he doesn't want to give it back sometimes to get more food! I highly recommend this spoon - it's a brand called Spuni (link because I love, no compensation) and it's been awesome for him. We actually got it in our Bluum box last month (fun subscription box of baby goodies - I'll do a post on one soon) and since we've been using it we haven't tried any other spoons because he does so well with this one! We have just finished sweet potatoes and are moving on to carrots now. Every four days we try something new - that's the recommended time frame to watch for allergic reactions. It's pretty fun watching him try new things! And then there are these gals. I feel bad that they don't get as much love on the blog as they used to - but I promise they are still around! They're good cats, they really have done so well with Oliver. 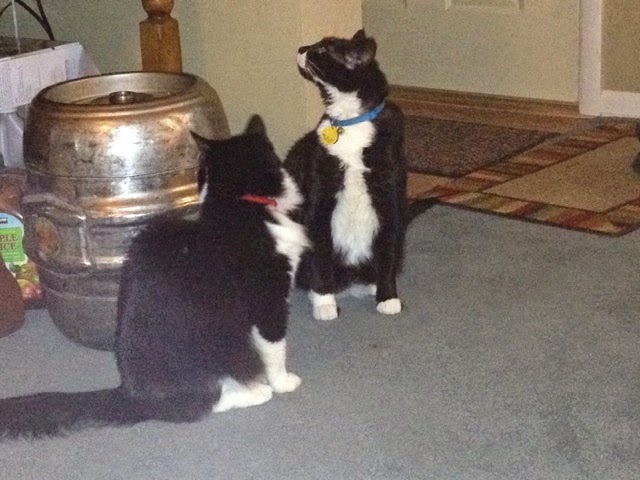 Pippin is finally starting to come around to him. I wouldn't call them best friends, but she can at least handle being in the same room as him and will even sit near me now when I am holding him. She hasn't done that since he was a few weeks old. Once he got more active she kind of freaked out, so I'm glad she's coming around. I snapped this picture of them last night - I was trying to catch them sooner, they almost looked like they were having a meeting of the minds. Of course they moved - but I still thought this one was pretty funny of them kind of looking at our friend's beer keg - maybe they're waiting for a pint? So that's what's new in our world. I'm looking forward to the weekend - it'll be another busy one, but hopefully our last busy one for a little bit. August looks a hair calmer than July was - though I said that at the beginning of July too and then it ended up as hectic as ever. I kind of don't mind though - I figure a full calendar means we're enjoying summer to the max right? What's new with you? I just had a mental image of the cats having a keg party while you're away! I love your new cabinet! OH! I love it. 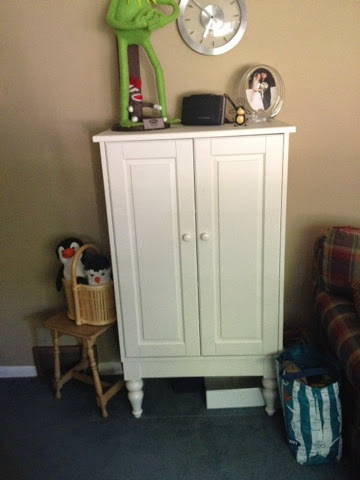 We need to get some new furniture, storage type specifically! Your cats are just too cute and your baby of course! That is a great cabinet and a great solution. And yes making baby food seems the way to go, this is what many of my friends have done. Hehe, the kitty cats just want a pint, love it. I'm sure my used-to-be-the-baby dog feels the same way. I love that Oliver uses a spoon! We haven't tried that with Jona yet, I'm afraid it will be a HUGE mess, but maybe we should try! He does try to grab the bowl a lot, and he loves finger foods. I use 3 spoons at a meal. Sometimes Ella holds 1 and sometimes 2. She will still take the spoon with the food but to do that she drops a spoon in her hand. Sometimes it drops on the floor so then I also have a backup spoon. Other days she just lets me feed her and she picks up puffs off her tray in her spare time. I even forgot you had cats!